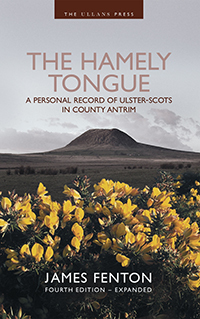 Comments: ‘The Hamely Tongue’ has been widely acclaimed as the authoritative record of contemporary (surviving) Ulster-Scots in its heartland of County Antrim where James Fenton faithfully recorded his dictionary items among a network of other native speakers over a 30-year period. This searchable online version of his book takes its text from ‘Part One’ of the fourth edition of 2014 and includes over 3000 word entries. The book preliminaries, supplementary word lists and end matter have been excluded. a1 ~ indefinite article (used (1) to specify a particular day: aye comes on a Friday; (2) with quarter and half in clock time: a quarter tae echt; a quarter by; a half past, etc.). naw a yin (see yin).